The Barnum Museum in Bridgeport, Connecticut, houses a wildly varied assortment of local, regional, and international historic objects. From the elephant in the hall to the mummy, from the circus posters to the Civil War uniforms, all the artifacts point back to one man and his lasting impression in Connecticut. P. T. Barnum was born and raised in Bethel, then made his fortune in New York City, but returned to Connecticut and called Bridgeport “home.” While the world knows Barnum for his work with the circus, his early careers are just as interesting. Recently The Barnum Museum was able to purchase a letter concerning Barnum’s lottery, which he ran in Bethel from 1828 to 1834. Known for entertainment, one of his first experiences in engaging the public, and profiting from it, was through the lottery. I made a very remarkable trade at one time for my employers by purchasing, in their absence, a whole wagon-load of green glass bottles of various sizes, for which I paid in unsalable goods at very profitable prices. How to dispose of the bottle was then the problem, and as it was also desirable to get rid of a large quantity of tin-ware which had been in the shop for years and was considerably “shop worn,” I conceived the idea of a lottery in which the highest prize should be twenty-five dollars, payable in any goods the winner desired, while there were to be fifty prizes of five dollars each, payable in goods, to be designated in the scheme. Then there were one hundred prizes of one dollar each, one hundred prizes of fifty cents each, and three hundred prizes of twenty-five cents each. It is unnecessary to state that the minor prizes consisted mainly of glass and tin-ware; the tickets sold like wildfire, and the worn tin and glass bottles were speedily turned into cash. After a year in the shop, P. T. Barnum moved back to Bethel and at the age of 18 became a lottery agent. He decided to buy tickets directly from Connecticut lottery managers and, having had early success, his office was deemed “lucky” and it grew beyond Bethel. Barnum’s lottery was no different from other lotteries, which played upon the human characteristic of being “willing to hazard a trifling sum for the chance of considerable gain.” He sold tickets and had agents as far as New York City at the height of his lottery sales. His lottery business did well and he built a store called the “yellow store” in Bethel where he sold groceries, hardware, and other “notions.” Unfortunately, he was not successful as a shopkeeper and he had begun to purchase too much and accumulated bad debts. He bought out his uncle, dissolved their partnership in 1833, and left with his family in the winter of 1834 for New York City. Barnum’s failure at the ‘yellow store’ and the lottery’s diminishing returns were well timed. The lottery in Connecticut was prohibited after June 3, 1834. The Barnum Museum’s letter, dated January 11, 1834, is from P. T. Barnum to an unknown individual in Bethel. The letter simply starts, “Dear Sir the bearer (my clerk) is on a lottery tour and I have told him (confidentially) to call and sell you a large prize.” The letter goes on to describe the recent prizes awarded out of Barnum’s lottery and has a postscript noting the growth of his venture and ends with “the more the merrier.” While the substance of the letter isn’t truly deep and profound, there are not many letters from these early business ventures in Barnum’s life. He is known for the circus and so those objects, be it circus programs, letters or advertisements, tend to be more readily saved and available in museums and libraries. 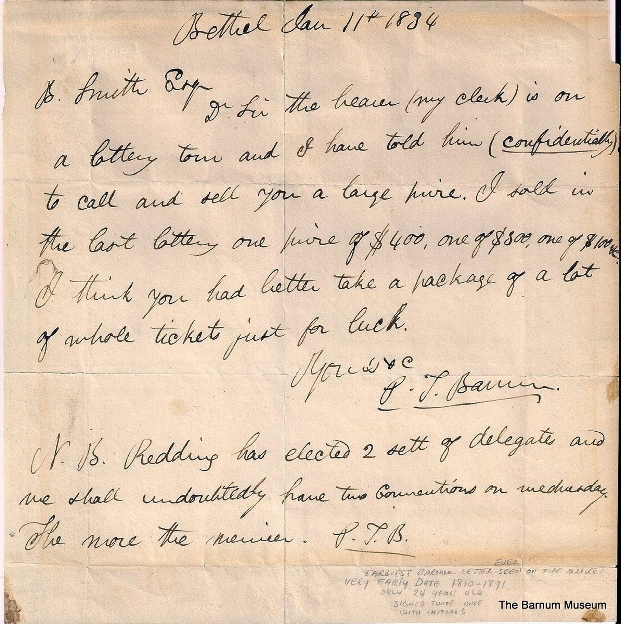 The Barnum Museum was thrilled to be able to purchase this rare letter for their collection following donations from the public. 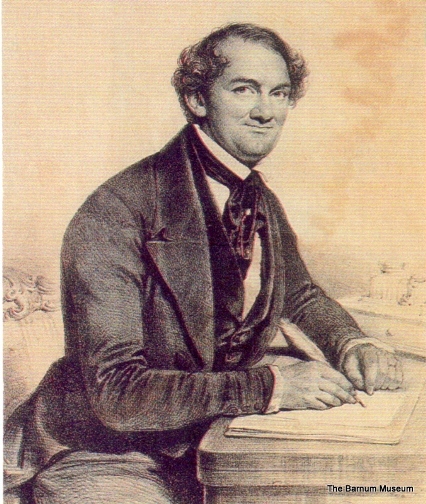 P. T. Barnum may not have succeeded with the lottery, but it was the basic human fascination with chance, with the unknown, that he continued to use in his development of entertainments like the circus for which he is famous. Melissa Houston is the Registrar and Museum Educator at The Barnum Museum in Bridgeport as well as the History Camp Instructress for the Newtown Historical Society. “Barnum’s Bridgeport.” Bridgeport History Center, Bridgeport Library, 2013. Link. “Virtual Exhibitions.” The Barnum Museum, 2013. Link. “Bethel Historical Society,” 2011. Link. “Catalog Record of The Herald of Freedom Newspaper Published by Phineas T. Barnum, Bethel, Connecticut.” CONSULS - The Connecticut State University Library System, 2013. Link. Barnum, P. T. Struggles and Triumphs, or Forty Years’ Recollections of P.T. Barnum Written by Himself. Buffalo, NY: Warren, Johnson & Co., 1872. Link.